Raumfahrt+Astronomie-Blog von CENAP - Blog: UFO-Forschung - Blick in die düstere Welt der Verschwörungstheorie, um zu sehen, was NASA im Jahr 2015 versteckte. 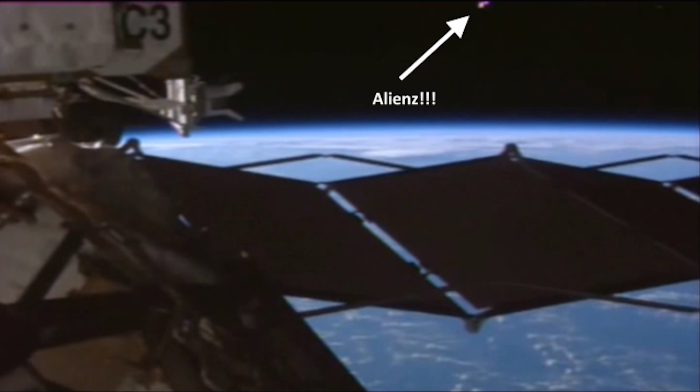 Screen capture of YouTube video showing "mysterious" pink object spotted by an International Space Station camera. "If you think that's bad, you should Google 'NASA hiding,'" one space agency official told me. So I did—and here are the first five things I found. The first search result is a Gawker story from August, which links to a YouTube video of space station footage showing a "pink spot" near the orbiting laboratory. The Gawker author had some fun with the story, but plenty of other websites treated the object as mysterious, possibly of extra-terrestrial origin. The reality is that a lot of space debris shares the station's orbital altitude, which could explain the bright object, or perhaps the video was taken from a camera that captured the reflection of something inside the space station. There are tons of these kinds of stories, like this mysterious object in a photo tweeted by Scott Kelly. (It's actually a part of the station structure.) Either way, the idea that aliens are flying around in a pink, brightly lit spacecraft that has only ever made one brief appearance near Earth does not adhere to Occam's razor. The second link leads us to a website calling itself "AnonHQ," as in the hacktivist group Anonymous. Whoever these guys are, thanks to their dogged research, they've found CONCLUSIVE EVIDENCE that aliens exist. It lies in a 2006 cable from the American Embassy in Vilnius, Lithuania, that contains a statement made by Albinas Januska. Then an adviser to the Lithuanian prime minister, the cable reports Januska saying that there exist a “group of UFOs, who are making influence from the Cosmos.” This claim, AnonHQ stipulates, proves that NASA has been hiding the existence of extra-terrestrial life. We're convinced. The third non-duplicative result links to an answer on Quora responding to the question, "Is NASA hiding evidence of intelligent alien life?" Yes, of course it is replies Harold Daniel, who establishes his credentials as a project manager and Web developer. Daniel asserts there is "plenty of evidence that would hold up in a court of law" for the existence of "actual objects, apparently under intelligent control, in our skies performing maneuvers impossible for our aircraft." Daniel also offers his readers, 22 of whom have upvoted him, an explanation for why NASA has hidden this secret from the public. Follow the money, he writes. "How do their ships work? What is their energy source? Do you think it is fossil fuel or nuclear fission? Probably not. But that's the third largest industry in the United States. $1.2 trillion. Would free energy be perceived as a threat to the status quo? Probably. Who's gonna rock that boat?" Who will rock the boat? Ars will. There is no free energy. 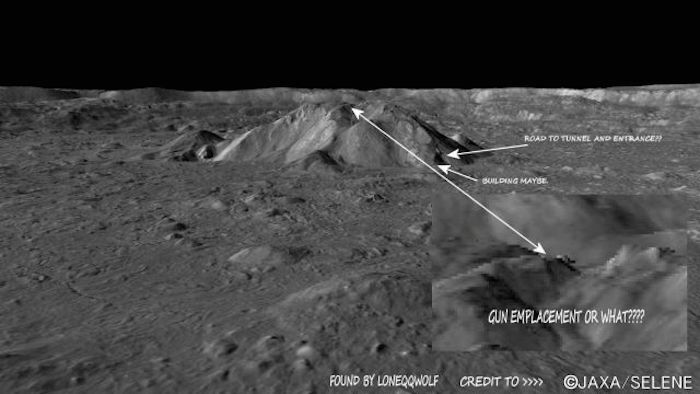 This link leads us to the website "Conspiracy Watch," which cites Milton Cooper, a Naval intelligence officer, who claims, "Not only does the Alien Moon Base exist but the US Naval Intelligence Community refers to the Alien Moon Base as 'Luna,' that there is a huge mining operation going on there, and that is where the aliens keep their huge mother ships." Sadly, the fifth link goes to an actual news story about Pluto's extended atmosphere, so we'll move on to the next link ... which is GLORIOUS. The website Rense.com tells us about the discovery of an "organic-looking" object on the surface of Mars (spoiler alert: it's a bunny rabbit!) But that's not the worst part. Our intrepid investigator tells us that NASA's Opportunity rover intentionally ran over the bunny: "Look to the rear at the rover's tracks. They make a beeline for the outcropping, except for a short diversion over to one side. The object appears to have been swallowed up by rover tracks. Somebody tell me it ain't so." OK. It ain't. After this little exercise, I think the best thing that can be said about modern-day conspiracy theories is that we seem to have moved beyond the whole Moon-landings-were-faked beliefs. At least a little.